One other thing. What would you consider the US EPA for the roadster. I used the 55.4 UK combined figure and simply converted in to US gallons (~46mpg). However, the EPA for Smart cars in the US seems a lot lower? When you look at them closely, the Roadster's aerodynamic aren’t great. They do have some things going their way. •	The Coupe has quite a nice Kammback. •	Front panel gaps are good. The front wings are bolt-on, so I've thought about taking a vacuum-formed mould of the current wings and laminating the inside of the mould to reduce the size of the bulge before making a vacuum-formed wing from the reduced size mould. Time is my main barrier to doing this! Are they that bad? They could easily be covered with some vacuum-formed plastic as they're nearly all decorative. Big Performance do some Perspex headlight covers that should help with the lighting aero, as you've discovered. I've fitted some Bosch aero wipers, which helps a little. I've thought of fitting a cover to the bonnet that send the air over the top but that'd stop the bonnet opening! •	The side mirrors are quite big for the size of the car. I've bought a rear-view camera, which I'm going to fit to remove the need for the wing mirrors. You can't realistically fit mirrors inside the car, simply because the shape of the car would prevent you seeing anything with them! •	As standard the wheelarch gaps are quite big (7cm) for a small sporty car. You're right, they're huge! Making new front wings would help here, I think. Alternatively, some plastic sheeting could cover the rear arches entirely and most of the front arches to make the gap smaller. •	The Tridion stands proud of the rest of the bodywork at the sides and top (esp noticeable on the Coupe). Really? I've never noticed that. I'll take a peek later. •	Large external hinges on the coupe. •	Wind deflectors for softtop. These are pretty much required to reduce the soft top wind noise and buffeting. Have you tried removing them? It's on my todo list, once I work out how they're attached. You can hear the wind noise they make, so it must be pretty bad! •	The panel gaps round the doors are terrible (about 8 mm). All the panel gaps are huge. The bonnet and the boot are also pretty bad. The main problem with the bulbous wheel arches, side air intakes and wheel arch gaps together is the unattached airflow along the side of the car. I've noticed (in the rain) that it reattaches at several places, the windows for example. The constant separation and attachment is really bad for the Cd. •	I put brown P profile weather striping along the side and bottom of the driver's door. Used "Back to Black" to 'paint' the strip black. I don't quite understand that. Do you have photos? Cunning! I've noticed that temperatures are never high on the Roadster, even at 35 degrees or more. In fact, it's only heat soak that makes the temperature go up when you stop. I've seen 100 degrees on the gauge! •	I made polystyrene blocks to fit into the sides of the front grille. Covered them with black insulating tape. •	I made a clear plastic deflector to deflect air past the driver's side-air intake. •	Changed the normal aerial to a shorter stubby. Do you not find the steering a little heavy? •	Upped the tyre pressure to 31/30. Manufactures recommended pressure is 29psi (I have 16 inch spike lines with 205 section tyres), but that's the max I find bareable. I think because they are low profile there's not much gain anyway. I've been looking at the wheels from a ForTwo. They're the same diameter as mine (15") but not so wide. They fit 145 section tyres, so there's gains to be had there. The front arches can then be correspondingly smaller. •	I've got lowering springs to lower the car by 25mm. •	Maybe remove the passenger wiper. I've also been thinking about a rear diffuser. That should minimise the wake of the car. In addition, adding creases to the trailing edges of bodywork should help separation. The round shape of all the panels can't be helping at the moment. •	Modify the pass side air intake to channel more (pressurised) air into it. •	Try to get smaller or more aerodynamic door mirrors. The problem is that it's difficult to get mirror bases for the roadster and the standard mirrors have leakage problems anyway. Good list! Some to add to mine there. •	Steel roadster 15 inch wheels with 175/185 section eco tyres. Also try to fit aerodynamic hub caps. I saw a noticable difference by going to Michelin Energy E3A @ 40psi. From memory, it was about 5%. Flat hub caps are on my list too. I was thinking about a sheet of plastic cable-tied to the wheel spokes. •	Lightweight seats. Standard seats are 20kg each. x 2 is 40kg. I had the idea of using polyurethane expanding foam and a plastic bag to make a lightweight seat. It's only needed for padding. However, you'll need to fabricate some seat belt mounts as they mount to the seats as standard. Also, you'll lose the ability to move the seat, which is fine for me, as the only driver and at 6'3", I have the seat far back anyway! I don’t think Smart ever published a cd figure for the Roadster. I’ve saw 0.41 mentioned for the ordinary roadster, but I don’t know how scientifically that was figured out. I suppose though even with that figure taking into account the frontal area, the cdA probably isn’t as bad as I think it is. I think what’s really interesting is the top speed difference between the Roadster and Coupe ~109 v 112 mph, eventhough the Coupe is 40kg heavier. The Kammback does have a significant effect there. Certainly. Although, take the top speed with a pinch of salt. Last month, I did 197kph (according to GPS) on a German autobahn in my notchback. My car, with the 205 section tyres, probably affects the fuel economy as much as the aero deficiencies put together. But financially (and aesthetically) it doesn’t make enough sense to change them for Roadster steel wheels. You're getting better mileage than me! What are you going to do to cover your mirrors? Be good to get broken mirrors from somewhere, then you could use the base plates. I haven't tried to remove them, I'm too scared! But it's bound to be worth removing them during winter when the roof won't be open anyway. I used P profile weather strip you get from B&Q and stuck it along the leading edge of the door. It's about 5mm wide, so almost covers the gap round the door. Yes, but it lightens up fine > 10mph. The sportline alloys look an excellent candidate. However, they would require 20 - 30 mm spacers at the rear. This may work but there's not much space for a diffuser behind the exhaust back box. Wow, that's an impressive top speed. Not many 80bhp cars can to that (if any?). Overall the cdA can't be too bad! I've not exactly worked that out yet! I think I see what you mean now. Good solution. You can buy them for just over £100 new from WellSmart. I've been pondering what tyres to go for. 135/80 is about 2% bigger rolling circumference, so I'll drop ~100rpm on the motorway. I can only find budget tyres but they're cheap at £27.10! 155/80 gives a 10% larger rolling circumference and about ~300rpm drop on the motorway. I can get branded tyres for £38.50. I think they'll be a good compromise, although I don't know how stiff the sidewalls are and what effect that'll have on the handling. I moved from the standard Bridgestones to Michelin Energy E3A, which meant a lower sidewall stiffness and slightly more nervous handling. They're available in Germany but they're not cheap. They're more for styling than effectiveness though. I don't think that was VMax power-wise. It was very noisy, so I couldn't be certain but I'm pretty sure it was bouncing off the rev-limiter, rather than running out of power. It certainly got there quite easily and wouldn't go faster, even downhill (I tried once on the flat and once on a downhill section). Tonight, I removed the wind deflectors on the top of the windscreen. They're just stuck on with hot glue! I just levered them up with a flat-headed screwdriver and scratched the glue away with my fingernail. I've also removed the passenger side wing mirror, although I've not worked out a way to make it neat yet. I may end up using a piece of 4mm Perspex and hoping for the best! Good work on the deflectors. Have you noticed any difference in wind noise? I think mine will be coming off tomorrow! This week I've removed my passengers side wiper and put rain repellant on that side. The rain stays off it ok when you go over 50mph, but beads a lot otherwise. I think my next mod will be mold inserts for the side vents. I'm going to use foil and wrap it closely against the body. Then use packing tape to make the outside part the mold (tape from the door sill to the outer part of the vent). Then use expanding foam in the crevace, building it up slowly to minimise any air bubbles. Hopefully then the outer layer will be hard enough to spray silver (to match tridion), don't know if I'll need any filler on top. Have you any experience with doing this sort of thing? I've also removed the passenger side wing mirror, although I've not worked out a way to make it neat yet. I may end up using a piece of 4mm Perspex and hoping for the best! Have you any pics? I was thinking of unscrewing the mirror from the base and leaving the base attached to the car (obviously this would be sticking out externally). Don't want to risk any leaks when I have a dry car! Also how did you remove it? My mirror base doesn't seem to have any screws. It seems to clip together. I know there were loads of revisions of the mirror bases. I didn't read Evilution before removing the mirror but I worked it out just how it's written; two torx screws to split it apart and two more that hold the main mirror part on. I've not split the mirror from the base, just left it open (it's not raining today). It's definitely not waterproof at the moment! One thing I've noticed from driving to work today is that I use my passenger side wing mirror a lot. I'll need to replace it with something. I'll have a fiddle in the garage later and take some photos. 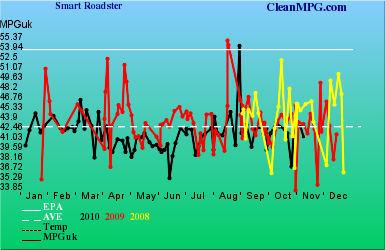 The wind deflectors and wing mirror have resulted in a massive decrease in wind noise. It's very noticable, especially at high speed. I've not had the roof down to check the difference in buffeting yet. I may remove my passenger wiper in a minute - it's pretty useless anyway! I also checked the prices of steel wheels and wheel trims for the ForTwo. 3.5"x15" wheels are ~£31+VAT and 4"x15" are ~£35+VAT. I can get some clip-in wheel trims for £25 and a few minutes with a hacksaw, a sheet of ABS, a craft knife and some epoxy should get me some aero wheels. I was looking at the side of the car last night and there's certainly room for manouvre by covering the vents up. Given that the body panels are all bolt-on, there's scope for building a more aerodynamic bodykit. I was thinking of using my current panels to mock up some rear arches that incorporate creased ttrailing edges and wheel covers. Then, I can get them off and use a vacuum former to make lightweight copies for peanuts and in seconds. I'm going to try out the vacuum forming idea with a panel at some point soon to see how it works in practice (weight/flexibility/price/finish). I've separated the base from the mirror this afternoon. I did cut a sheet of 4mm Perspex to size and put it in the oven on a baking tray at Gas Mark 6 until it went floppy. By the time I ran it out to the garage, it'd cooled, so I gave up with that and used the base. Best bet is probably to butcher the base for an improvement. I stuck a piece of gaffer tape on the hole that the cable passes through, being carful not to block the drain hole in the bottom. It should be as good as standard now, just with a little less frontal area. I also tried to remove the passenger wiper arm but I couldn't pull it off when the nut was removed. I suspect the aluminium and iron have welded themselves together over the last 5 years. I'm not willing to put more welly behind it and I don't have any pullers. I was looking at the offset differences in switching wheels. It looks like if you changes to 4 inch rims on the front, the rims would be recessed by 16mm against your spinlines. Rears would be in by 25mm. I think the smart wheel trims look good (and aerodynamic) but are expensive at £25 each. The wiper arms were difficult to take off, I had to get a wiper arm puller from e-bay. Don't think it will ever be worth £10! Must get some pics of my grill block for you. Also I was thinking about the diffuser you mentioned. I think it would make the aero worse. The vacuum it creates would only add more drag. The Chevy Volt aero video convinced me of this. On the other hand, i'm not sure if i'm prepared to add straight edges to the back of the car to help the airflow detach from the back of the car cleanly.